The love of turf in the sports field has revolutionized to now being on almost all fields. Many sports such as football, soccer, and softball/baseball use turf, and is either loved by the athlete, or despised by an athlete. Although there are many positives and advantages to having turf, such as low maintenance, and water maintenance, there are still many hazards regarding turf. Turf can contain a lot of chemicals, that are not good for the brain, and can cause dizziness, and unconsciousness. Since I am an athlete, and I have played on turf, I can actually relate to being dizzy on turf. Whenever I play on turf, I tend to get headaches, just because of the chemical smell on the turf. Also, when there is hot weather, turf makes the air a lot hotter, therefore causing more headache and dizziness. Lastly, turf can be extremely dangerous to play on, since there is not a lot of friction between an athlete’s shoe, and the turf. Since turf does not have the regular mud, soil, or texture that grass has, it is easier to slip. Even though there are still many advantages to the installation of turf, I believe that we should hold off on installing turf, and stick to real grass, even though maintenance is needed. There are not health risks, and it is a lot cooler, and safer. Next Next post: I HEART Sports Med! I enjoyed learning more about the pros and cons of turf. 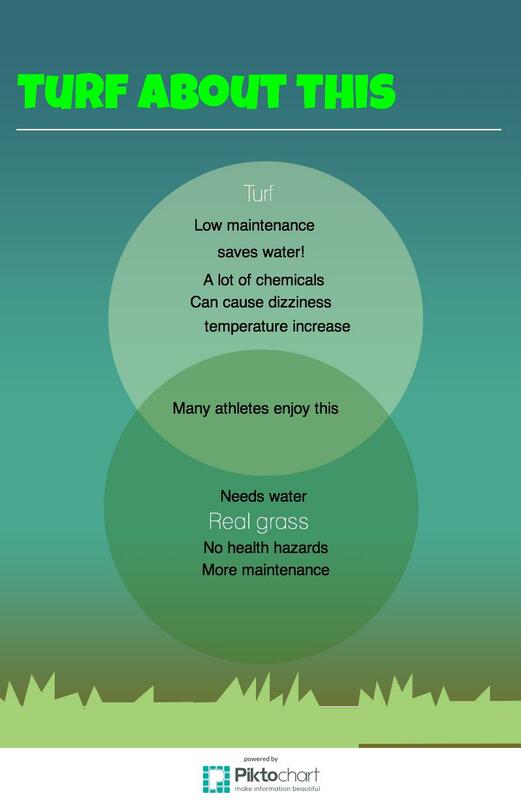 While I want to help conserve water, no athlete’s neurological health is worth risking for use of turf. I hope that in the future someone can develop non-toxic turf so that the best of both worlds can be enjoyed. I agree with all of this. As a college athlete I play on turf In the outfield because I live in a rainy city so turf is the best option. Turf can be nice because it’s easy to dive on and has nice hops. However it is annoying when you have little turf pellets everywhere when you get home. Also I can attest that turf does make you dizzy. When it’s super hot your feet feel like they are going to melt off therefore making you more dehydrated. Also it’s hard to breathe on turf when it’s hot. I’ve had a bad experience with turf and I got a concussion. I hit so hard to the ground that I’ve had sever memory lost due to it. The impact was so hard because it is purely cement right under turf.